The garden has become a jungle, as it often does at this time of year. My tomatillo is about seven feet tall and way too big for the small tomato cage it’s in; it’s fallen over into the dill. The tomatoes are equally unruly, well over six feet tall, and sprawled over the main section of the garden. I keep picking anything that has a hint of color so that we get the tomatoes, rather than the squirrels, because, honestly, squirrels are jerks and would take a single bite out of every ripe tomato in your garden if they could. Even my chard is approaching several feet in height. I have a few flowers on the squash plant, but I’m not positive they’ll turn into anything. I picked the yard-long beans when they were only a foot long and I fear no more will grow this year. The peppers are slow to perform, but at least one of them finally has fruit on it. The one in the back of the garden is being blocked by whatever pollinator bush I planted a couple years back. I should pull some of it out, but there is a yellow jacket colony in the back part of the garden and I’m a little nervous about messing around too much back there. In the next few weeks I’ll need to start considering some fall plantings, but right now there’s nowhere to put anything. I could probably sow some lettuce seeds in between the tomato plants and see if anything comes of them later in the autumn once the tomatoes are done. Our peppers are slow as well this year, but yesterday I finally harvested a few Sweet Hungarian Peppers. You know it’s August when you walk outside to your garden and think, “Well. 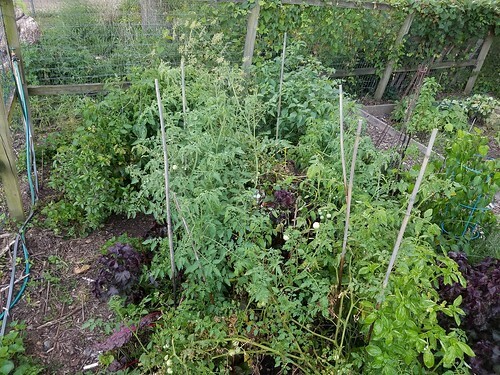 This is completely out of control.” I missed my raised beds this year (I only had container tomatoes – which turned out to be ok since June was as hot as August and they’s have given up anyway).